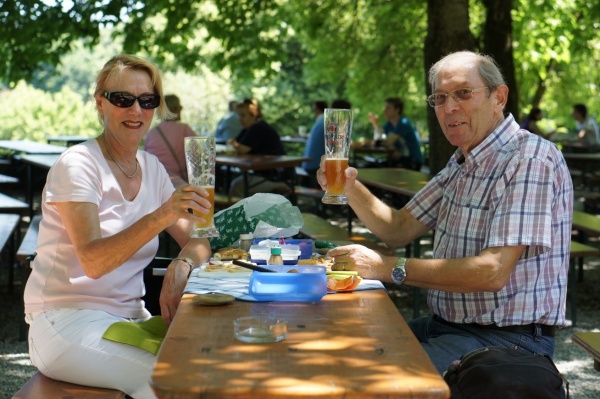 The Rosengarten beer garden is located on a small artificial hill overlooking a small lake in the westernmost end of Westpark in central Munich. The Rosengarten restaurant connected with this beer garden across the road was the official restaurant of the first International Garden Show (IGA) held in Westpark in 1983 at the time of the launch of the entire park area. Traditional wooden beer benches and tables offer place for 1,500 guests below a cluster of large and dense chestnut trees. The Paulaner Hell (lager) costs €7.00 p/Maß (July 2015). Despite the fact that Rosengarten was built especially for a garden show, it was unfortunately a bit run down in recent years. However, as of June 2012, Rosengarten relaunched with a new management and has improved remarkably. Amongst other changes, there is a new pretzel and Steckerlfisch stall. Furthermore are regular music events planned. Nearby attractions include a Japanese pagoda and Seebühne, an open-air cinema and concert venue. During the summer months the beer garden is open already from 9am giving the opportunity for a “Frühschoppen” with an early morning Maß. Closing time depends on the weather and can be an hour or so before or after midnight.